Even though we’re no longer kids, Halloween makes us feel nostalgic for that spooky feeling that ghost stories inspire. If you want your romantic getaway to give you goose bumps, consider a visit to Savannah (shown at left) or Charleston – or even both as they are just a 2.5-hour drive apart. In these charming, but undeniably haunted, historic Southern cities (Charleston dates to 1670, Savannah to 1733), the weather in November is still mild and once all the kitschy Halloween décor is taken down, their authentic ghostly pedigree shows. I have visited both cities twice and would return to either in a heartbeat – knowing it will certainly beat faster when the sun goes down and the spirits come out to play! Savannah: Ever since John Berendt’s “Midnight in the Garden of Good and Evil” hit best-seller lists in 1994, this quirky city in the heart of coastal Georgia lowcountry has been synonymous with hocus-pocus. In fact, Savannah is considered by many to be the most haunted city in America, with its spooky cemeteries (including Bonaventure shown at right) and squares ringed with oaks dripping with Spanish moss. 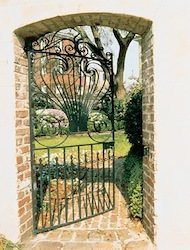 But by day, the city of antebellum mansions and ornamental ironwork is beguiling. Considered so beautiful that it was spared from torching by General Sherman on his 1864 March to the Sea, Savannah is ideal for strolling (elaborate architectural flourishes abound, so have your camera ready), antiques shopping, and effortlessly stepping back in time. Start your visit at the south end of Forsyth Park, home to the elaborate and much photographed cast-iron fountain built in 1858, and wind your way back toward the river through the city’s historic district, comprised of a grid of 22 scenic squares (there were originally 24), each lined with grand mansions – including Mercer House, setting of the murder in “The Book” as locals call “Midnight in the Garden of Good and Evil,” which is on Monterey Square. It, like a number of Savannah’s historic homes and churches, can be toured. Others not to miss include the Owens-Thomas House, an exquisite example of Regency architecture, and the Isaiah Davenport House Museum, which is a Federal-style jewel. You’ll also pass an impressive display of historic churches and temples, including the First Bryan Baptist Church, built in the late 18th- century and the oldest continuous African-American church in the U.S., and Temple Mickve Israel, the country’s only purely Gothic Revival synagogue. You’ll end your walk at the Savannah River, where the centuries-old cotton warehouses on bustling River Street now house hotels, restaurants, galleries, and shops. Savannah is known for its paranormal activity, so a ghost tour after dark is an absolute must. 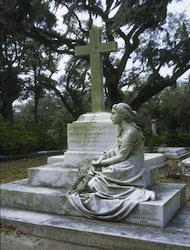 There are dozens of options on offer, and most visit the sites of the city’s most ghastly murders and notorious hauntings – including Colonial Park Cemetery, Moon River Brewing Company, Wright Square, and several mansions that are now inns, such as Kehoe House and Eliza Thompson House. 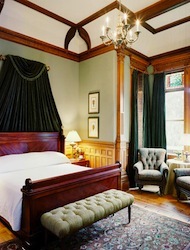 For romantic ambience and a wonderful location right off Forsyth Park, consider The Gastonian, comprised of two Regency-Italianate mansions built in 1868 featuring 17 rooms with working fireplaces (shown above at left), from $179/night. Also nearby is the 126-room Mansion on Forsyth Park, which offers lavish-meets-modern décor in a restored Victorian mansion, from $229/night. Charleston: There is much to savor in this South Carolina city – and not just the ghosts. Yes, it is a place once filled with dungeons and gallows, occupied by pirates and soldiers and battered by canon fire and hurricanes, creating a history ripe with lore that will make your hair stand on end. The city cannot escape the fact that its tumultuous history is indelibly tied to both the slave trade and the confederacy. But modern Charleston is charming, hospitable, and oh-so photogenic. And it is the home of fresh and flavorful lowcountry cuisine – shrimp and grits, crab cakes and catfish – that will haunt your taste buds forever. Front and center on your Charleston must-sees is the postcard-perfect Battery (shown at right), a long stretch of waterfront real estate fronted by a walking path and lined with some of the city’s grandest and most historic homes. 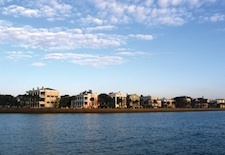 Dating to the early 19th century and built by wealthy merchants and traders, each is unique in its interpretation of the era’s top architectural styles – Federal, Greek Rival, Georgian, and Italianate – each with expansive covered verandahs seemingly designed to out-do the neighbors'. You can tour several historic homes set on or near the Battery, including the Edmondston-Alston House and the Joseph Manigault House. The city’s haunted center, said to be the site of apparitions and eerie lights, is located around a few square blocks on and around Church Street that are home to three churches (hence the name), several cemeteries, the former Slave Mart, the Pirate’s Courtyard, the Dock Street Theatre, and a haunted residence (131 Church St.). I won’t ruin the suspense by sharing the tall tales – you can hear them yourselves on one of several ghost-themed walking tours with Bulldog Tours. 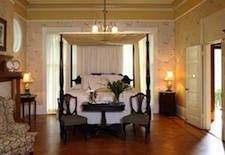 full-service hotel with elegant room décor and the excellent Charleston Grille restaurant, from $285/night. To truly step back in time, book at the 21-room Wentworth Mansion (shown at right), a luxuriously restored 19th-century residence where the mansion rooms have king-sized beds and whirlpool tubs, from $329/night. See our Savannah Travel Guide and Charleston Travel Guide for more trip-planning information, then use our Travel Search price comparison tool to find the lowest rates on flights, hotels, packages, and more travel deals.